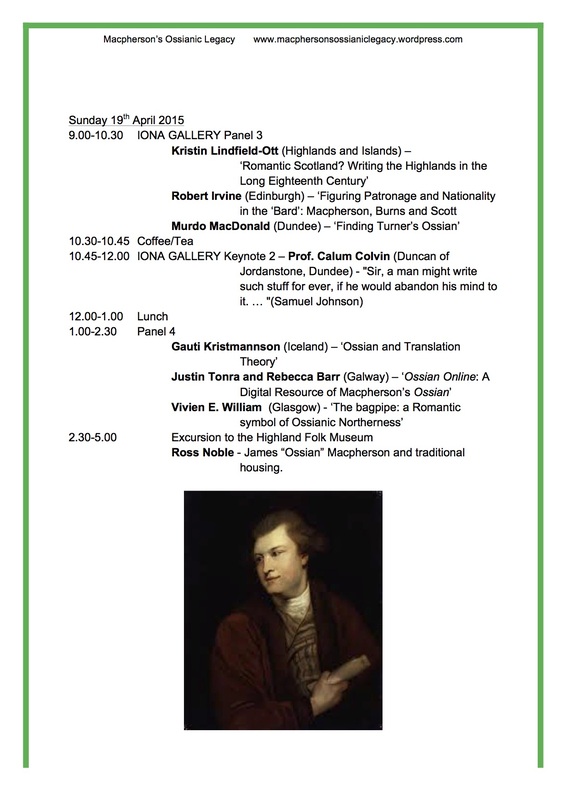 A new book on James Macpherson and The Poems of Ossian has been published this month. Edited by Prof. Dafydd Moore (Plymouth University), the International Companion to James Macpherson and The Poems of Ossian brings together essays by scholars from different disciplines. Join us on the anniversary of Macpherson’s death for a celebration of Macpherson’s life and work at his obelisk, near Kingussie. I have finally finished reading Macpherson’s History of Great Britain, and I am ready to write about it. 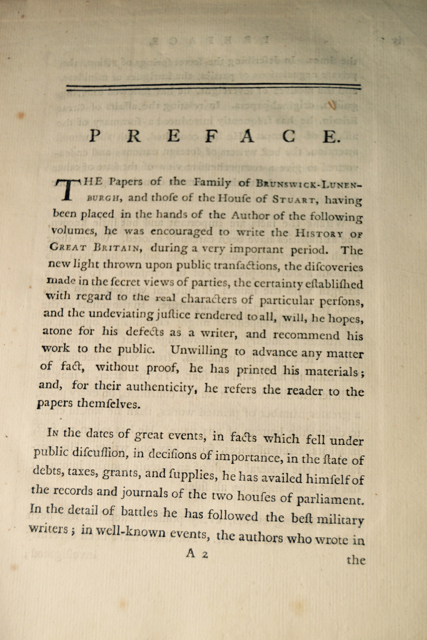 I have spent today with the excellent ‘Preface’ to the History, which you can read here. In the ‘Preface’ to the History Macpherson discusses a number of different points of historiographical theory: what makes a good historian (truth, impartiality); sources (new material, comparisons, distinctions between different kinds of sources, when to cite/quote); the reasons for this particular history (focus on under-researched period). In his approach, here, he is modern, and his emphasis on truth and impartiality is in line with Enlightenment historiographical theory (such as that from Blair’s Lectures on Rhetoric, published 1783). However, his emphasis on and detailed engagement with sources is different, and marks a significant contribution to the history of historiography – one largely ignored by historians, who tend to favour Leopold von Ranke (1795-1886) as the ‘founder of modern source-based history’ (Wikipedia). 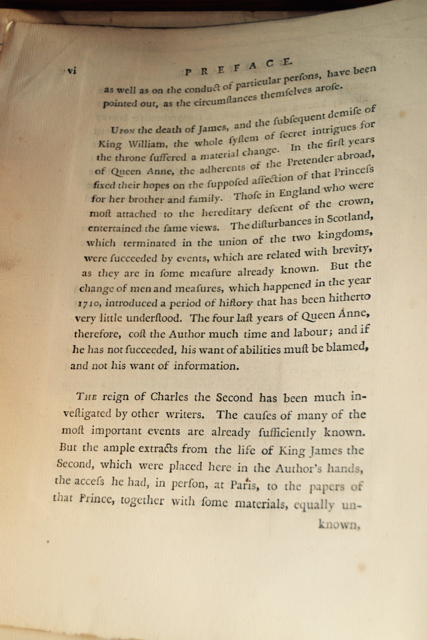 The ‘Preface’ gives detailed information about Macpherson’s approach to history writing. His object, he says, is truth, and he presents himself as an empiricist who is objective and impartial, without ‘predilection for any party’ (vii). For Macpherson, objectivity is tied to evidence, and this is the heart of Enlightenment cultural theory: scientific methodology for history/philosophy/literature. Like Blair and Smith in their Lectures on Rhetoric and Belles Lettres, like Hume’s Treatise of Human Nature and Enquiry Concerning Human Understanding, like Hutcheson’s ‘common sense’ philosophy, like Ferguson’s anthropology and like Smith’s economics, Macpherson placed central importance on the concept of evidence. Evidence leads to impartiality: he is ‘not conscious of having once departed from the obvious line of evidence’ (vii), and the need for evidence lies at the heart of his detailed engagement with sources. 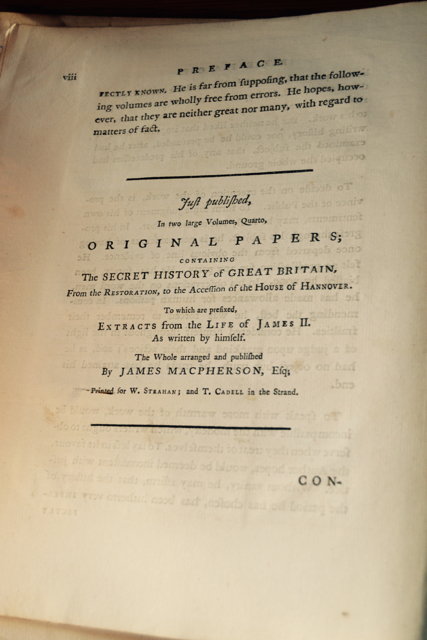 It has been suggested that Macpherson published the Original Papers – the ‘secret’ sources of his History – as a response to the authenticity debate, and to forestall any criticism of his History, but this is naïve: his emphasis on sources – both the discussion in the ‘Preface’ and indeed the separate publication of the Original Papers – speaks to his deep-rooted Enlightenment belief into the value and necessity of empirical evidence. Without evidence there can be no impartiality or objectivity, and this explains the detail into which he goes in the ‘Preface’ as to how, why and when he uses sources. Sources speak to Empiricism, rather than to Ossian and the authenticity debate, and this situates Macpherson in the heart of the Enlightenment. This is what makes him a scholar and a professional historian, despite not having a university post. ‘Enlightenment’ and ‘Empiricism’ are contextual necessities for understanding Macpherson’s ‘Preface’ better. His opening remark that the papers of the families of Brunswick-Lunenburgh (that is, Hanover) and Stuart were ‘placed into the author’s hands’ (iii) is an example of this: here we see Macpherson as scientist-historian, ready to conduct his scholarly experiments on these papers. This, then, sets him up as impartial from the start: he has access to both Hanover and Stuart family papers and, as we will see, he uses these equally frequently and equally critically in his History. But he does more here than to set up a framework of impartiality: the papers are not publically accessible published records (at least not until he publishes them as the Original Papers), and Macpherson sees his role as that of an empirical philosopher, analysing evidence and presenting facts. As such, he consciously adopts the methodology of empirical research: analysing documented experience, and writing a history based on evidence. Macpherson is careful to assure his readers that his History is balanced, and evidence-based; it is ‘truth’. 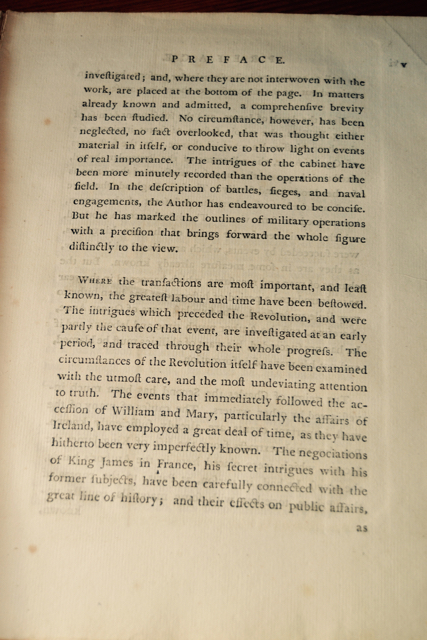 He argues that his History throws ‘new light […] upon public transactions’ (iii): through his examination of hitherto publicly unavailable documents he reshapes our understanding of politics in the late 17th and early 18th centuries. Indeed, the focus of his history is on public affairs, not private ones; this relates to his methodology of truth and impartiality because he is facilitating a better way for the public (reading public, political public, British public) to understand its own past. Prior to the History and the Original Papers the public had not had access to important documents for this period of upheaval, but through Macpherson’s publication and analysis of these papers these ‘public transactions’ become truly public. 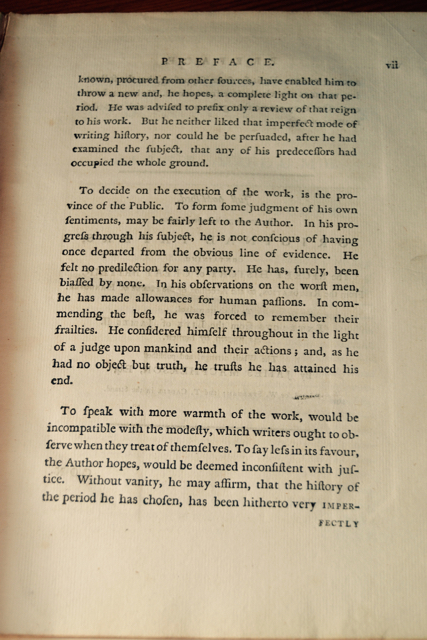 Because the public had access to both the Original Papers and Macpherson’s narrative of them, his objectivity/impartiality and, for want of a better word, histiorical ‘truth’ were publicly accessible: it was easy for the public to compare the sources with the history (unlike, say, in the case of the Ossianic Collection). This process of publishing both materials and history helps to authenticate Macpherson’s history, and confirms his methodological comments on truth and impartiality. If readers can see your sources they can spot the holes in your argument, and they can spot your bias. By publishing the sources with the history Macpherson makes it possible for the public to judge his impartiality – and thus how good a historian he is by Enlightenment standards. When discussing his aims Macpherson uses the language of science. He argues, for example, that there is ‘certainty established with regard to the real characters of particular persons’ (iii); in other words, that his empirical method allows him to narrate people as they really were. He is both a ‘what happened’ and a ‘so what’ historian – a chronicler and an interpreter. 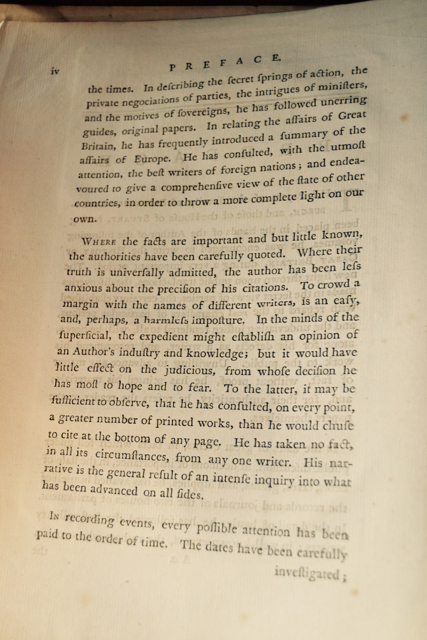 ‘Certainty’ about the characters of people is a big claim, and a difficult claim to prove, but it isn’t just empty rhetoric: because his sources are published with the History, and because of the nature of the sources (journals, for examples), Macpherson’s role as narrator of facts – as establisher of certainty – differs from early pre-Enlightenment histories. His historiographical method is grounded in sources not witnesses; traceable written evidence rather than hearsay. This is why he can claim ‘certainty’ – it resides not only in his confidence of having treated his characters fairly, or his Enlightenment belief in the necessity of evidence, but in the fact that the certainty is, indeed, verifiable as the sources are accessible. Macpherson claims political impartiality in the ‘Preface’, claiming ‘undeviating justice’ in the rendering of ‘all’ persons (iii). This is a necessary claim for two reasons: 1) methodologically, 2) personally. In terms of methodology, Enlightenment empiricism places crucial importance on objectivity, and weighing up evidence; Macpherson’s approach of consulting many sources, and especially private personal sources from both the Hannover and Stuart fulfil this need. On a personal level Macpherson also had to claim impartiality: as a government spin-doctor, embroiled in government affairs and with high-ranking patrons, as Highlander from a Jacobite clan in London, it was imperative that he attempted to relate an impartial history. The timing of the History – it ends with Queen Anne’s death – allows him to avoid discussing Hanoverian rule, but the History nonetheless contains a great deal of characterisation of both Whigs and Tories, of Stuarts and Hanoverians, and of Jacobites. Macpherson’s claim in the ‘Preface’ that he will render ‘undeviating justice’ to all makes him a judge of character – but then, as the sources are published, so are his readers. Whether or not we believe his claims to justness, the fact remains that these claims set the tone for the History – once made in writing any hint of partiality is given easy ammunition by such claims. As such, making this claim works doubly in Macpherson’s favour: firstly, because it signals to the public that he is writing as a scholarly historian, not a party-political hack; secondly, because it forces him to be objective. Having experienced the debate, confusion and damage unguarded claims about ‘materials/manuscripts/real 3rd-century sources’ can cause, and having learnt from this experience, Macpherson is careful to promise only what he can keep. He is keenly aware of the need to forestall any arguments about authenticity and Caledonian bias, and he delivers this from the outset. This is why he opens the ‘Preface’ in this way, and why he explicitly discusses his methodology here. He writes that he has been ‘unwilling to advance any matter of fact, without proof’ (iii), and that this proof is the Original Papers, which he calls ‘his materials’ (iii). Indeed, he ‘refers the reader to the papers themselves’ to ascertain ‘their authenticity’ (iii) – the authenticity of his narrative, that is. Authenticity is, then, a key historiographical concept for Macpherson. Authenticity and impartiality confer truth, which – in Enlightenment mode – is created through evidence. This line of argument is picked up at the end of the ‘Preface’; Macpherson starts and ends the ‘Preface’ with the theme of objectivity. He states that ‘he is not conscious of having once departed from the obvious line of evidence’ (vii); another instance of the scientific language that we noted earlier. His empirical historiographical method – results derived from a line of evidence – is clear, and clearly stated. This serves to assure his readers that his history is impartial and unbiased, without (as he says) ‘predilection for any party’ (iii). But it does more than that: it sets Macpherson up as a serious, modern historian. In his History Macpherson is no Celtic antiquary – no amateur historian like Walter Scott’s Oldbuck in The Antiquary (1816). Macpherson is a professional; a man of science, who uses empiricist methods in his analysis of historical sources in order to write a modern analytical history. 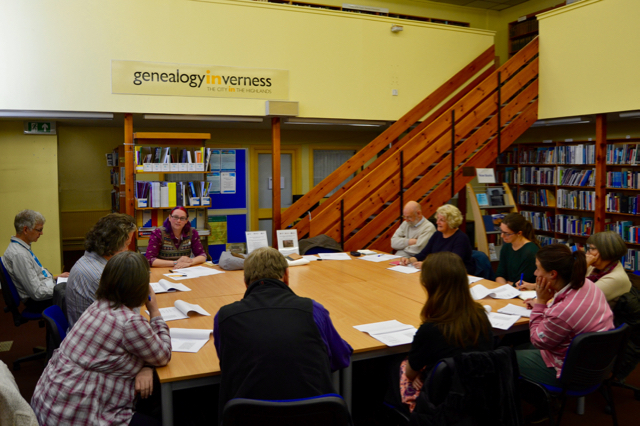 Last Thursday (1st October 2015) saw the first workshop of the Meet the Books project at Inverness Library – and it focused on Macpherson! Led by Dr Kristin Lindfield-Ott, the workshop focused on the Fragments of Ancient Poetry, the first of the Ossianic publications. There are three copies of this in Inverness Library’s ‘Fraser Mackintosh Collection’ – two in good shape, and one with a very crumbly spine. After a short introduction to the project and some introductory remarks on Macpherson, the workshop got underway – although led by Kristin, it was very much conducted by the 12 participants. Everyone was provided with photocopies of pertinent passages, which allowed for ‘up, close and personal’ interaction with the text. All participants joined in cheerfully, and contributed to lively and stimulating readings and discussion that focused on the title page, the preface and one of the fragments. This was the only Meet the Books workshop this year on Macpherson, but there will almost certainly be one on his works next year. You can see the full programme of workshops here, and read the weekly blog, which highlights items from the collection, here. I’m spending every Wednesday in the company of Macpherson. 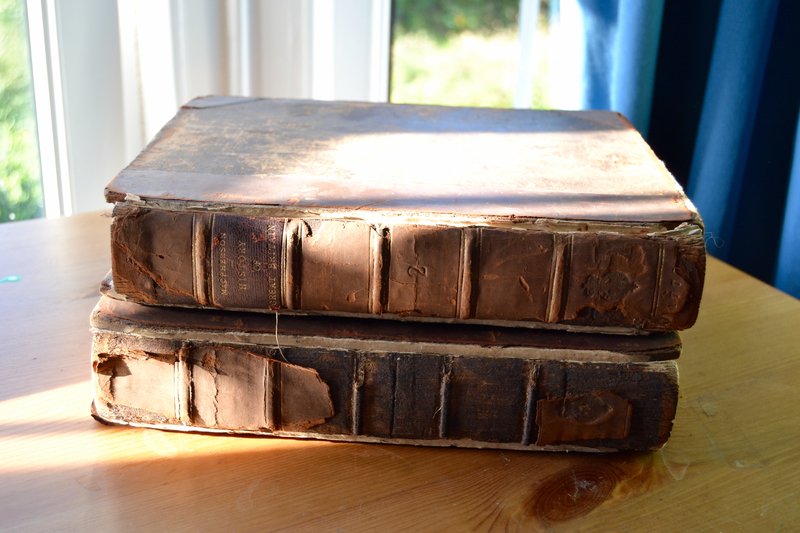 Wednesdays are my research days, and at the moment I’m working my way through his two-volume History of Great Britain, first published in 1775. As you can see, they are hefty volumes. I’m reading them for a particular purpose – to support my argument that Macpherson always operated as a historian, and I’m looking for clues to his historiography: his way of writing history. It’s less about what he says, and more about how he says it: how he uses evidence, how he engages with other historians, how he marks sections as ‘previously unknown’, and what he tells us about his practice as a historian. A good starting point for these sorts of enquiries are prefaces, and Macpherson’s provided one for the History. I rather enjoyed reading all of this. I’ve read it before, but it’s good to come back to it. As well as writing on the History, I’m also teaching it this semester in a third-year class on eighteenth-century Historiography – we finish with Macpherson. As last year, when the class ran for the first time, I’ll be curious to see what the students make of this, and how they think Macpherson’s compares to other historians of the period. Macpherson’s Ossianic Legacy is more than just the heritage festival/conference. The project is the umbrella for a number of ventures: publications, public engagement projects, work with and shaped by the community in Kingussie. Today we want to tell you a little bit about one of the outputs, Macpherson the Historian. This is the title of the book Dr Kristin Lindfield-Ott is working on. It has been contracted to Edinburgh University Press, and the manuscript is due early in 2018. The book has grown out of Kristin’s long-standing research on Macpherson, and develops part of her PhD thesis further. Macpherson the Historian offers an alternative understanding of James Macpherson, the ‘Ossian forger’: as a historian. 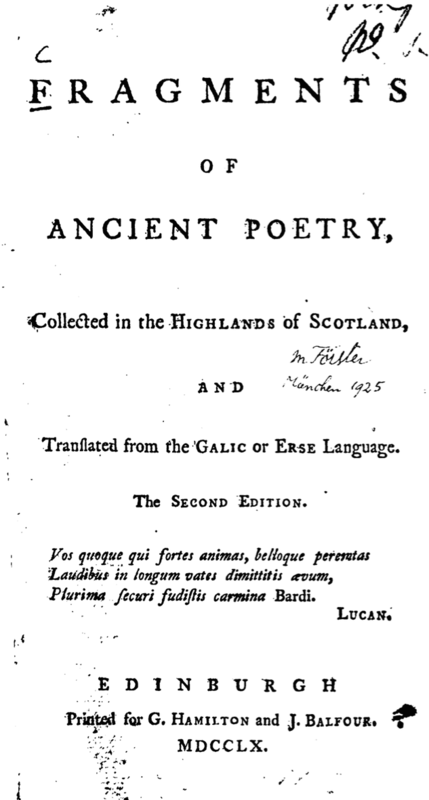 It argues that Macpherson wrote history not just in his explicit histories of Scotland and Britain in the 1770s, but in fact throughout his long and varied career, from his earliest publications in monthly magazines and the Ossian poems to his political pamphlets. As such Macpherson the Historian brings together his literary, political and historical writings to explore questions such as ‘When does fiction become fact?’, ‘When does fact become fiction?’, and ‘How important are narrative, sources and authenticity to historical writing?’. Macpherson’s works present different versions of the past, and reflect the development of historiography in the eighteenth century, from earlier biographical historians to professional historians and conjectural historians. A figure on the edges of the Enlightenment and Romanticism, Macpherson celebrates and preserves the nation’s past in poetry, translations, histories and pamphlets. Investigates examples of nation-building and questions of post-Union Scottish and British identity, which will change your perception of national (Scottish, British) and regional (Highland) identities in the Enlightenment and beyond. relevant today: Macpherson as a Scot in London, who retained close connections to his Highland home while promoting a sustained and nuanced British identity without losing sight of Scottishness in his works, will make you question contemporary notions of national identity. Over the next three years Kristin will blog here at Macpherson’s Ossianic Legacy about the progress of the book. 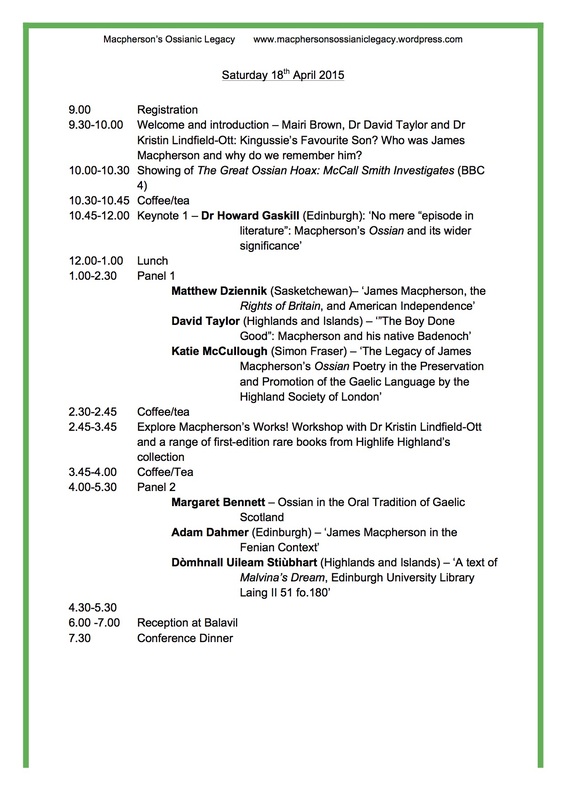 The Programme for the Conference/Heritage Festival has now been confirmed. Registration for the Conference / Heritage Festival is now open! Welcome to Macpherson’s Ossianic Legacy. If you have come here for more information about the conference/heritage festival, please follow this link or click on ‘Conference / Heritage Festival’ at the top of this page. You can also find a contact form on that page – please don’t hesitate to get in touch if you have any questions. We are planning a host of events and activities to do with Macpherson and the Ossianic Collections. 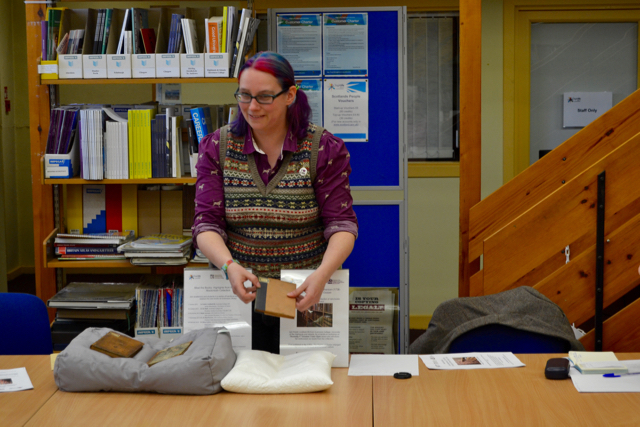 Apart from the conference and heritage festival, we are hoping to hold public lectures and workshops, design a ‘Macpherson trail’, have a range of display boards in and around Kingussie, and work on a children’s book. We’d love to hear from you if you have ideas for Macpherson- and Ossian-related events/activities!